Portia is 14 years old - the same age as Macky, but her life has been very different from his. 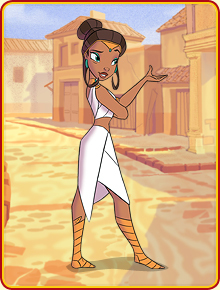 As a member of a rich Roman family, she's always had the best of everything - education, clothes, food, and culture. Until she meets Macky, she doesn't give much thought to the advantages she's had; they're simply what she would expect as a Roman. She has certainly never thought that the Romans were wrong to invade other peoples' land and try to get them to believe the same things that they do. Portia's father is a senior Roman army commander, but he's far away with his troops, and she lives with her uncle Tiberius, who is the powerful Governor of Alexandria (the setting for Series One). Her uncle is no substitute for a caring father and Portia misses him - though she would never admit it. As a Roman, she's expected to be strong, and to cope with all that life has to throw at her. Meeting Macky and his family, Portia begins to get a sense of what she is missing. She finds herself drawn to them, especially Macky. There are enormous obstacles: class, religion, money (and the lack of it) - not to mention Macky's dangerous involvement in activities which he hopes will set his people free from Roman rule - activities which the Romans would punish severely if they ever found out. But Portia starts to see her fellow Romans through Macky's eyes, and that, combined with the wonderful stories he tells her, begins to change her. She starts to use her own strength of character to help others, and in the course of thirty-nine episodes, we'll see her change from spoiled child to gracious young adult. Click the play button to watch the video!